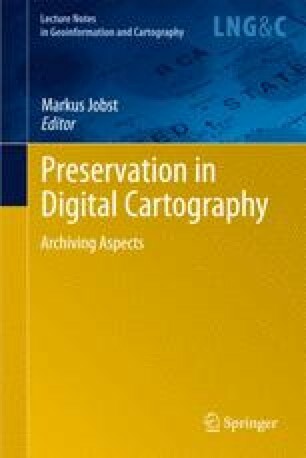 The preservation of digital cartography may result in a digital cartographic heritage in future. One main requirement is the understanding of structural aspects in terms of technological and semiotic dependencies. These dependencies become clear when prominent features of modern digital cartography are discussed and their important core characteristics lead to structural considerations to describe a digital heritage´s content. On the basis of these remarks a conceptual cartographic heritage architecture can be designed, which should help to understand technical complexity within the preservation of digital cartography. Brügger, N. (2005) Archiving Websites. General Considerations and Strategies. Aarhus: The Centre for Internet Research. ISBN 87-990507-0-6. http://www.cfi.au.dk/en/publications/cfi.